An environmental health disaster is unfolding in West Bengal and Bangladesh. Tens of millions of persons in many districts are drinking ground water with arsenic concentrations far above acceptable levels. Thousands of people have already been diagnosed with poisoning symptoms, even though much of the at-risk population has not yet been assessed for arsenic-related health problems. Over the last two decades in Bengal, untreated tube well water was heavily promoted and developed as a safe and environmentally acceptable alternative to microbiologically unsafe untreated surface water. In the 1980s, scientists began finding evidence of arsenic contamination, but only very recently (mid-1990s) has the crisis emerged into broad public awareness. The origin of the arsenic pollution is geological in this case - the arsenic is released to groundwater under naturally occurring aquifer conditions. "Analyses based on 18,417 (4,125 lab) aggregated by union. The surface estimated based on the union-wise probability assigned to the centroid of each union. Calculation by IDW using a fixed radius of 7.5 km, a 1.5 km grid, and 3.125 union data points." Color version of Fig. 1, Arsenic in groundwater: testing pollution mechanisms for sedimentary aquifers in Bangladesh. J.M. McArthur, P. Ravenscroft, S. Safiullah and M.F. Thirlwall. Water Resources Research, in press. � J.M. McArthur. View the paper at the London Arsenic Group website. amit, thanks for the post. recently there was a small victory in the british courts against the UK Geogrpahical Survey people that botched survey results a decade ago - had the numbers been at that time more could have been done. I read about this Arsenic Poisoning in ground water in West Bengal, India and Bangladesh around 2 months ago in Down to Earth, an indian environmental magazine. I was shocked to read the article. Water pollution is going on the rise and i think that bangladesh could even have to import water after some time if this problem isnt checked now. What could be its reason ? Rafiq - This arsenic poisoning is affecting both Indians and Bangladeshis with the main effect in Bangladesh. So, this topic is of importance to indians as well. Rajputro - I dont know how i posted this in the "Bangladesh" forum, but now u shifted it into "Forget Cricket" forum. This topic is of importance to us guys as in both the countries lots of people could die due to Arsenic poisoning. I am also going to post the effects of arsenic poisoning here after i find them out. you can find more links on the right hand side of that page that will give you some of the info you are looking for. 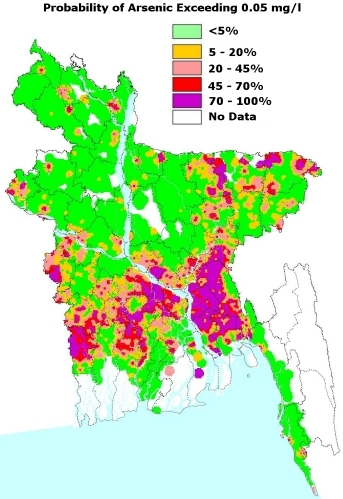 bangladesh has been battling arsenic for over a decade now.